It won't be possible to wipe the smiles off the faces of CSU student engineers as they open their books and start learning in their new building opened today. 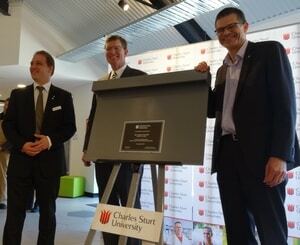 It won't be possible to wipe the smiles off the faces of Charles Sturt University (CSU) student engineers as they open their books and start learning in their new building opened today. CSU Vice-Chancellor Professor Andrew Vann was joined by the Member for Calare, Mr Andrew Gee, MP, and Foundation Professor of Engineering Euan Lindsay at the official opening at CSU in Bathurst. Professor Vann, who trained as a civil engineer and worked in engineering consultancy prior to becoming an academic, remarked at the official opening how the new building hailed another chapter of growth and development at CSU. 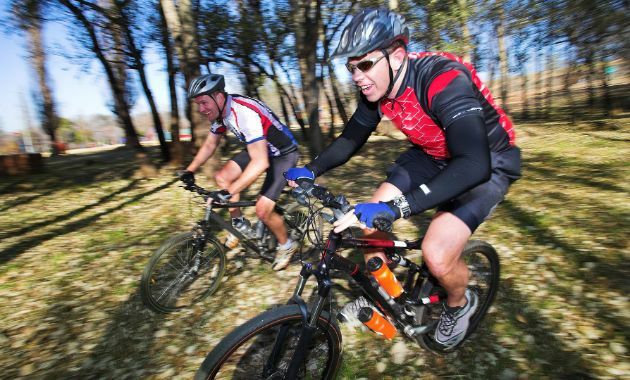 "The $14.3 million investment in this purpose-built facility was certainly worth it. It offers highly flexible and engaging spaces that are not only contemporary and cutting edge, but also reflect the long history of Charles Sturt University in Bathurst," Professor Vann said. "While being a place of learning, the building design has also won four awards, most recently at the 2017 Architecture Awards. A testament to the architects, builders and designers, and we are grateful and proud to be the home for this award winning asset." An advocate for CSU and its importance to the central west, Member for Calare, Mr Andrew Gee spoke highly of the University's commitment to investment in its engineering course. "Charles Sturt University has put a lot of skin in the game with the significant time and resources it has invested into its engineering course, and this building certainly highlights that commitment," Mr Gee said. "As part of the National Innovation Science Agenda (NISA) the federal government has clear objectives in its focus on the importance of Science, Technology, Engineering and Mathematics (STEM). "It is pleasing that Charles Sturt University has thrown its support behind engineering and aligned its course offerings to ensure its graduates are equipped for the future to take on the many roles within STEM, seeking highly skilled and qualified candidates." Foundation Professor of Engineering Euan Lindsay said that this building will become a centre of excellence and provide students with the modern, state-of-the-art facilities they need to be able to learn and engage with their course and each other. "This building and the engineering course at CSU lives up to the motto of the University, 'for the public good', by ensuring the University's engineering graduates are able to address the needs of our future workforce in Bathurst, the central west, regional Australia, and beyond for years to come," Professor Lindsay said. Member for Bathurst Mr Paul Toole, MP, was also present at the ceremony and said the opening of this building was not only a proud day for CSU but for the City of Bathurst and the region. The photo shows (L to R): CSU Foundation Professor of Engineering Euan Lindsay, Member for Calare Mr Andrew Gee, MP, and CSU Vice-Chancellor Professor Andrew Vann. Also present at the opening were the Mayor of Bathurst Councillor Graeme Hanger, Councillor Monica Morse, Councillor John Fry, members of the University Council, representatives of industry, staff and students of the University.